During August–September 2008, the second season of excavations was conducted at the Neolithic site (License No. G-30/2008; map ref. 254035–88/776828–7155). The excavation, on behalf of the Israel Antiquities Authority and the Centre National de la Recherche Scientifique (CNRS), was directed by H. Khalaily and F. Bocquentin, with the assistance of Y. Lavan and Y. Ya‘aqobi (administration), N. Samuelian (field supervision; Univeristy of Paris I), G. Le Dosseur (bone tools; CNRS), O. Barzilai (flint) and L. Kolska-Horwitz (fauna), as well as the participation of students and volunteers from France. Thanks are due to A. Assaf for his constructive comments and to the members of Qibbuz Manara for their support. 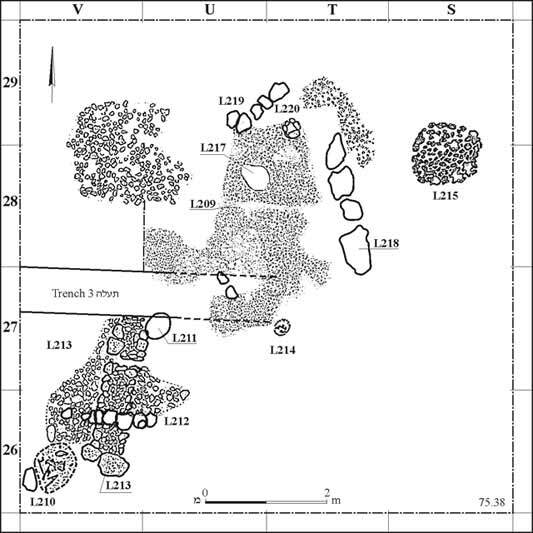 The excavations were concentrated in Area F, c. 50 m north of Area E and next to Trench 3, which were excavated in the previous season (HA-ESI 120, Fig. 1). Sixteen squares (2 × 2 m; depth 1 m) were excavated and three strata were identified, for which other definitions are used (Surface, A, B). Surface layer (thickness 0.15 m) included the remains of a thick layer that had been removed in the past when fish-breeding ponds were dug. The layer comprised dark brown packed sediment, mixed with small and medium-sized gravel. Numerous flint tools and Neolithic pottery vessels were discovered. Stratum A (thickness 0.25 m) consisted of tamped, light gray sediment and a small amount of gravel. The stratum was rich in finds and contained sections of walls, installations and tombs. Stratum B (thickness 0.6 m) was the principal level, which consisted of light brown and packed sediment. Three stratified layers that were associated with construction phases could be discerned. The lower layer comprised dark brown soil, which contained ash concentrations and lumps of pinkish brown soil that indicated their close proximity to a hearth, as well as a paucity of finds. It seems that this layer was intentionally tamped for use as a base for construction above it. The middle layer (thickness c. 0.1 m) was a dense foundation of small and medium-sized stones that extended across most of the excavation area. Concentrations of stones, which probably constituted the bases of installations, were noted inside it. The upper layer was gray friable clay, which consisted of a building that was surrounded by installations. A number of architectural remains were discovered and excavated; four were ascribed to Stratum A. The first is an east–west aligned stone wall (W212; length 2 m) that was discovered on the surface. The wall, built of a single row of large stones, was not connected to the rest of the remains in the area. The second set of remains were those of a stone wall (W213; exposed length 2.3 m), oriented southwest-northeast, which was built of two parallel rows of large stones, with a core of small stones. The foundation trench of this wall was dug into Stratum B, although its stones protruded above the stratum (height 0.25 m). The wall consisted of two sections, separated by a channel (width 0.1 m). The wall may have been part of a large building that was destroyed, probably when the fish-breeding ponds were installed. The third set of remains consisted of a primary burial (L210; Fig. 2) that was discovered next to W213. The deceased was an adult individual interred in a lined pit, which was oriented northeast-southwest. A large flat stone at the southwestern end of the grave had probably been used as a tombstone. Most of the skeleton was discovered in articulation, but the skull was found some distance away, indicating a later disturbance that is assumed to be rodent activity in the area. The fourth group of remains included a shallow round pit (L211; diam. 0.5 m) that was discovered adjacent to the northeastern end of W213. The pit was excavated to the upper level of Stratum B and contained dark brown friable sediment and human bones, mostly burnt. In light of the scattered bone fragments and the absence of any vertebrae or skull bones, this seems to be, undoubtedly, a secondary burial. The remains of Stratum B were exposed throughout the entire excavation area. The outline of a rectangular building that had a thick plaster floor (L209; Fig. 3) was discerned in the center of the area. The bedding of the floor comprised small stones (thickness c. 0.2 m); small flat stones were arranged above it and the spaces between the two were filled with lime, which was also used to plaster the floor. The walls of the building were apparently built of mud bricks, placed on a stone foundation in the north (W219) and east (W218); it seems that the mud bricks in the rest of the walls were set directly on the stone level. A round installation (L220) in the northeastern corner of the building had apparently served as a column base. The building had another plaster floor whose remains were discovered in the section of the trench, c. 0.2 m below the upper floor. 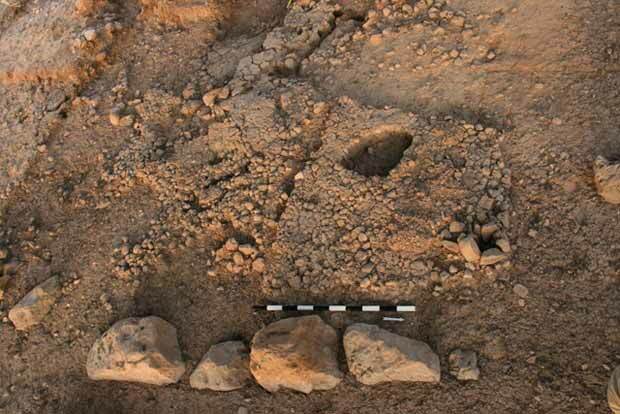 Despite the limited scope of the excavation area, numerous architectural remains that enable us to reconstruct the nature of the settlement at the site in the Pre-Pottery Neolithic period were exposed. The main building in Stratum B resembles Building 50, which was discovered in the excavations at the site in the 1970s. The flint assemblage is homogenous and characteristic of the late phase of the Pre-Pottery Neolithic B period. Some of the flint cores have two opposed striking surfaces and were used for producing blades. Noteworthy among the formal tools are the denticulated sickle blades, large ‘Amuq-type arrowheads and many axes, some have a polished cutting edge and others were shaped by a technique known as “Hula knapping”. The economic basis of the site residents combined hunting wild animals, such as deer, cattle and wild boar, and agriculture, as indicated by the multitude of sickle blades and axes. The remains are characteristic of a central settlement that existed in the eighth millennium BCE. A number of settlement phases were discovered in the excavated area and although the habitation is not dense, it belongs to the site whose remains were unearthed in the 1970s and in the previous excavation season. 2. 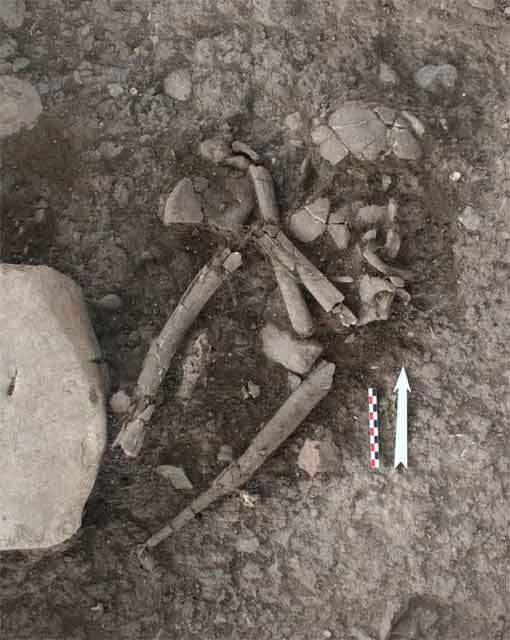 Locus 210, an articulated burial, looking north. 3. Building 209, looking west.